What customers are saying: "Thanks, this is definitely worth upgrading to." Have you ever felt frustrated because you know that you have installed that new prop but cannot seem to find it anywhere in DAZ Studio? Don’t let that get you down, because once you know where to look for your 3D content and why it is there, you will be able to find it faster. Are you a slave to the search bar in the Content tabs always asking yourself, "Why can’t I find anything?" For those of you tempted to respond with "anyone can perform a search", we say you are absolutely correct. However, once the search results are returned, many DS users do not know how to analyze/interpret the results and are dependent on the search engine to find their content. This tutorial will show you how to find your content in the Content Library and Smart Content sections of DAZ Studio and why it is there. Both DAZ Studio Formats and Poser Formats are discussed along with how to find the exact filepath DAZ Studio is using for your particular computer system. Please note that the package download size is ~283 Mb. 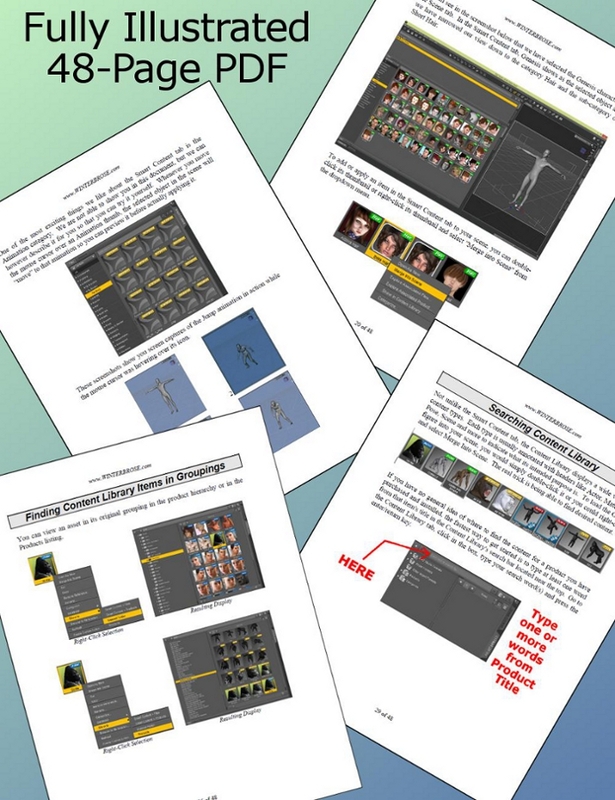 In addition to the 48-Page Fully Illustrated Standard PDF, this package is accompanied by eight (8) videos in both MP4 and WMV formats all prepared using DAZ Studio 4.8 (DS48). These videos cover all the instructions you need to find your installed content. If all of that wasn't already exciting, how about being able to watch the video instructions directly from the PDF! Links are included in sections to directly access the accompanying videos without having to exit your reading. Read it! Watch it! & Do It! Be sure to keep the ZIP folder structures intact for the MP4/WMV Video links to function properly.